As “Elizabeth’s Pantry” is now up and running, it seems like it may be a good idea to develop a few guidelines. Note: We would like to be careful not to over-manage the pantry – that’s simply not LifePoint’s way of doing things, but it does seem to be in our best interest to place a few simple measures in place to insure the longevity and effectiveness of the ministry. 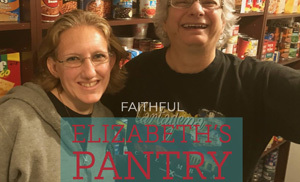 Elizabeth’s Pantry is for LifePoint partners and attenders primarily. People who come to us from outside the church family will be encouraged to seek help at The Sharing Center (CLICK HERE). There may be some obvious exceptions to this rule and anyone within our organization could decide to help a needy person with food items if they have a personal connection or significant relationship. Use your best judgement. This is per James 2:16. Food help may be obtained by calling the church office or emailing a pastor and arranging a time to pick up groceries. There is no need to call the benevolence team. Suggested use per family is once per month, about 3-5 bags of groceries per household. Use your judgement here. Our goal is to help a family out and in such a way that it is not embarrassing to receive help. Some families may need more than that, many will need less. We will inform the benevolence team when help is given: This is just so they are in the know as they may also be asked to provide financial help. We will inform the pantry managers when food assistance is given: They have been doing a fantastic job coordinating, sorting, and labeling the food. They need to know if the pantry is used so they can re-arrange, restock, etc. If someone is in need of food for more than 3 consecutive months, we may refer them to additional financial counseling. Once again, the goal here is grace and benevolence. These are just a few ideas to help the ministry remain sustainable for many years.